This is a close-up of a Ki'i -- a carved wooden image that guards the Hale o Keawe heiau (Hawaiian Temple) at Pu'uhonua o Honaunau on Hawaii's Big Island. These figures, which had religious significance in the traditional Hawaiian culture, were placed at sacred locations. 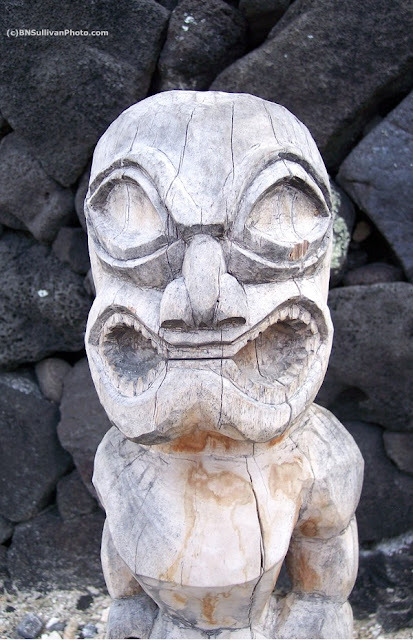 In some other Polynesian cultures, a similar type of carved figure is called a Tiki. Great pics! Loved the history behind it, or at least how it was part of the history. Specially love the little wooden Ki'i, I think I have one of those somewhere in my house...or something similar to it, prolly like a Tiki. You have a beautiful place to live too, with lots of things to capture on camera. Hi Akoni - Thanks for stopping by. Yes, I must admit, there are plenty of good photo subjects here in Hawaii. I haven't seen a Tiki in a long time and I'm sure this is much bigger than the ones I've seen (mostly ones one might wear around their neck). Isn't this the idea that the Brandy Bunch found? Look out it is bad luck. Nice photo. @ 2Sweet - I just now saw your second message. Thanks you for the award. I just have a tiny little tiki on a necklet! This is the first time I have seen one this size! Great pic!